What in the World is Patrick Coffin Doing? 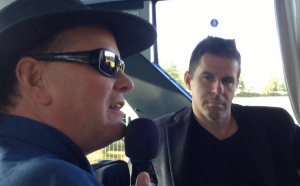 Patrick and I do a “live show” together on a bus in Ireland! What fun! Patrick Coffin has been the host of Catholic Answers Live for seven and a half years. He raised the show to stellar heights but September 30th was his last day. He is leaving Catholic Answers for new ventures in media. You can watch his 3-minute video for an overview of his new media projects. It might not be a bad idea to help support him as he gets this worthy project under way. Visit his new website here. God bless Patrick! Sept 30 is my last on-air day at CA. I’ve had a fantastic seven and a half years hosting Catholic Answers Live and the podcast Catholic Answers Focus. But I’ve got big plans for a broad, more culturally engaging platform, driven by a free podcast, a YouTube channel, and a myth-busting video series. I was privileged to join his last show on September 30 as we reminisced about his long stint on Catholic Answers Live and my monthly shows with him over the years – 90 shows at least. You can listen to that “Farewell Show” here or download the podcast here. After 7 yrs of listening to CA live it was a privilege to listen live and via podcast straight from Sydney Australia. And likewise, I’ll miss the great bond when Steve was on monthly with Patrick. God bless the new venture.